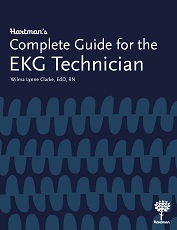 There are many existing resources for EKG interpretation, but Hartman’s Complete Guide for the EKG Technician is different. It is a comprehensive resource specifically written for students working to become EKG technicians, and it covers every aspect of the job, from communicating with other care team members to measuring vital signs to placing electrodes accurately and conducting the full range of EKG tests. A rhythm interpretation chapter features detailed illustrations of normal and abnormal cardiac rhythms, based on real EKG tracings. Over 100 practice exercises, also based on actual EKGs, allow students the opportunity to hone their skills in measuring intervals, calculating heart rate, analyzing waveforms and regularity, and identifying rhythms. Instructors click here for a free sample of this book for adoption consideration. The instructor’s guide to teaching from our textbook contains the following elements for every chapter: an overview of teaching strategies; page references for the textbook; teaching outlines for every learning objective; and critical thinking activities that may include case studies, role-playing scenarios, games, or conversation starters. Appendices include a compilation of the textbook’s Quick Reference charts, a fillable chart for interpretation of cardiac rhythms, 160 additional EKG rhythm identification exercises, chapter review questions, and a sample certification exam. PowerPoint presentations for each chapter complement the instructor’s guide content and include all procedures, rhythm identification exercises, and key illustrations from the textbook. The PowerPoint slides also incorporate the critical thinking activities, chapter review questions, extra rhythm identification exercises, and sample certification exam from the instructor’s guide. Our customers consistently tell us that we offer the most competitive pricing on the market.